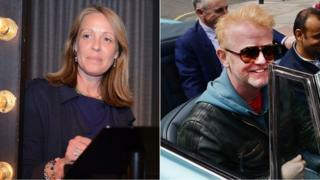 Image caption Shillinglaw called the former TFI host a "brilliant" and "wise" man who "had an awful lot of ups and downs in his career"
BBC Two controller Kim Shillinglaw has played down suggestions that new host Chris Evans will be joined by a female co-presenter on Top Gear. On Wednesday, Evans told BBC Radio 5 live that the "on-camera" Top Gear team would "definitely" include a woman. However later in the day, Shillinglaw said there would be "no gender diktats" with regards to the presenting line-up. She said female presenters would be considered, but the decision "will be about what's right for the show." "It has always been a very male world hasn't it?" Shillinglaw told Steve Hewlett on BBC Radio 4's The Media Show. "I think it's a part of thinking about how we could do things differently, to get a lot more spontaneity in to the show." But added: "I have never in my life thought about an individual show in terms of gender diktats and I certainly wouldn't start doing that now." Like Shillinglaw, Evans has insisted that any female addition to the show would be chosen "not for the sake of it". Asked by Steve Hewlett, on Radio 4's The Media Show, whether there would be a female on the Top Gear team, Evans said: "I think there has to be." "There are some fantastic girls in and around the motoring world - it would be silly not for them to be represented." He further clarified his comments on his Radio 2 breakfast show on Thursday. "It was quoted in the papers, and it has been again this morning, that I said yesterday there would definitely be a female co-presenter," said Evans. "There'll definitely be a female presence on the show and that could well be a co-presenter. It could be two. It could be no co-presenters, and film reporter or a driver..."
Evans has announced open auditions for his Top Gear co-hosts, saying anyone from around the world with "a real appetite for cars" was welcome to apply, whether they were "famous people" or not. "If you're up for it, we want to hear from you," said the Radio 2 DJ, "but you've got to know about cars". On Thursday's radio show, Evans gave details of the audition process, which invites applicants to post a video on an as-yet-to-be-revealed website, from Friday, 19 June. The videos must meet the following criteria. • Applicants must be over 16. • They should talk direct to camera. • Videos should be shot "from the waist up". • Cars should not feature in the video. • Entrants must be knowledgeable about cars "because Top Gear has to have an authenticity". • The video must be no longer than 30 seconds. "If it is, we won't watch it." Classic Car Show host Jodie Kidd and Formula One presenter Suzi Perry have both been tipped for presenting roles alongside Evans - effectively replacing co-hosts James May and Richard Hammond. The original line-up quit the show after Jeremy Clarkson was sacked for punching a Top Gear producer in March. Speaking on the Media Show, Shillinglaw confirmed that May and Hammond had considered returning to the show, but turned down the BBC's offer last week. "In the end a deal was offered to them and they felt that deal wasn't quite right for them. You know what, that's absolutely their choice," said the BBC2 controller. She said the offer was made to Evans when those discussions came to an end. "The important thing was there weren't multiple conversations going on at any one time. We felt we wanted to do this right and do this respectfully. "Everyone as far as I am aware has conducted themselves with real grace and thoughtfulness." Evans, who has signed a three-year deal to host and produce the BBC Two show, will also continue with his Breakfast Show slot on BBC Radio 2, and is reported to be earning £5m from the Top Gear deal. "Chris... has a brilliant quality for generating surprise on television. I think that's something that a show like Top Gear needs," said Shillinglaw. "Having had an awful lots of ups and down in this career, I think that he wants to work with us to make sure that the surprise ends up on screen, and is to the benefit of the show and to the benefit of the viewers," said Shillinglaw. Top Gear is watched by 350 million viewers worldwide, with overseas sales worth an estimated £50m a year.